and an amazing new year!!! 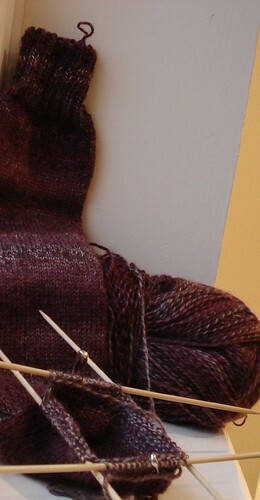 Mum and Dad’s Xmas presents are on the needles… Socks! 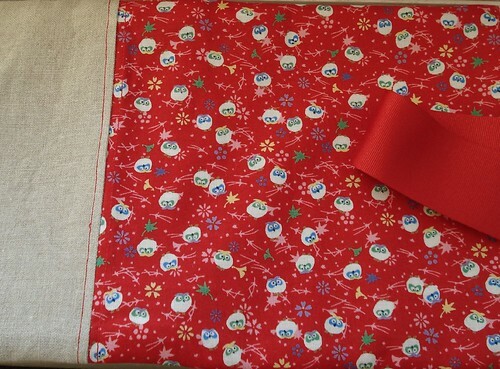 The dreaded present (usually from old aunts) will this year come from their beloved daughter! The socks are part of a nice but small pack of other handmade or custom made things! I hope they like it (and I sincerely hope they fit)! 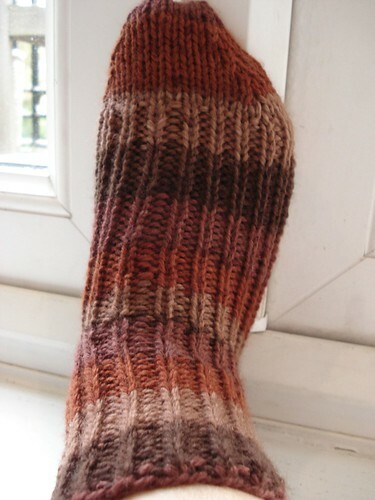 This sock is the first to be finished (no photos of the accomplishment yet! ), from the pattern by Rosa Pomar, with Trekking XXL 147 bought here. Although the pattern is very clear and I would recommend it to all Portuguese speakers, I still ended up with 2 tiny holes on the heel (need to perfect my technique) and I’m sure the toe wasn’t supposed to be done like I’ve done it (I’m under the impression I cheated a bit!, but can’t see where I messed up). In any case, it looks lovely (photo later). It is addictive, I tell you! And now I’m facing such a hard dilemma – explore other patterns! Doesn’t seem like a dilemma at all, I know, but if you consider it takes me ages to finish one sock… I’ll have to wait at least 2 weeks before being able to explore and see the results of a new pattern! So I’m thinking that maybe letting this sock be an only child for a bit is not so bad… or is it? Needles, I need more needles of the same size, so I can have at least 2 patterns going on at the same time! I had been thinking about sock knitting for ages, but actually seeing the handmade socks of Crafty Doula and Claire gave me the motivation to get 2 (yes, not just one!) 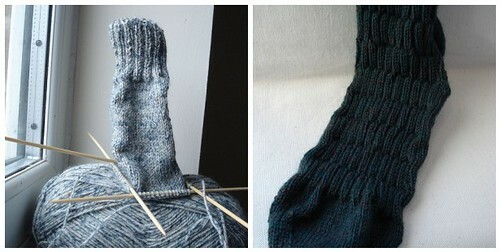 sock knitting kits. This sock is the proud product of kit one. Kit two will come shortly (?). Have to say – this thing is very, and I mean very, addictive! I can’t stop now, not even at pub quizzes! !